The Western diet is high in omega-6 fatty acids and low in omega-3 fatty acids. Canola oil contains a healthier omega 3 to omega 6 ratio than corn oil. Jurkat T leukemia cells were treated with free fatty acids mixtures in ratios mimicking that found in commercially available canola oil (7% α-linolenic, 30% linoleic, 54% oleic) or corn oil (59% linoleic, 24% oleic) to determine the cell survival or cell death and changes in expression levels of inflammatory cytokines and receptors following oil treatment. Fatty acid uptake was assessed by gas chromatography. Cell survival and cell death were evaluated by cell cycle analyses, propidium-iodide staining, trypan blue exclusion and phosphatidylserine externalization. mRNA levels of inflammatory cytokines and receptors were assessed by RT-PCR. There was a significant difference in the lipid profiles of the cells after treatment. Differential action of the oils on inflammatory molecules, following treatment at non-cytotoxic levels, indicated that canola oil mimetic was anti-inflammatory whereas corn oil mimetic was pro-inflammatory. These results indicate that use of canola oil in the diet instead of corn oil might be beneficial for diseases promoted by inflammation. The ratio of omega-3 to omega-6 in the average western diet is heavily weighted in favor of omega-6 . When tested as single fatty acids, omega 6 fatty acids tend to be pro-inflammatory but omega-3 fatty acids tend to be anti-inflammatory. Therefore, omega-3 deficiencies have been implicated in inflammatory diseases, cancer, cardiovascular diseases, dyslipidaemia and metabolic syndrome [1, 2]. The human diet is very complex and foods provide a mixture of fatty acids in different ratios not just one single fatty acid at a time. Food is the source of two essential fatty acids, linoleic (omega-6) and α-linolenic acid (omega-3), which cannot be synthesized de novo in animal cells and, therefore, must be obtained from the diet. A good dietary source of omega-3 with an omega-6 to omega-3 ratio of 3:1 is canola oil. We hypothesize that consuming canola oil in the diet instead of corn oil could decrease pro-inflammatory stimuli. There is a lack of data aimed at exploring the effect of complex combinations of food fats in in vitro models. In general, many in vitro models focus on only single fatty acids at different concentrations [3–6]. Therefore, to be more relevant to human health, it might be beneficial to consider an experimental design closer to the ratios of the components found in the food which might be consumed. There is a body of evidence demonstrating that fatty acids affect T lymphocyte functions. In vitro and in vivo studies have shown that fatty acids modulate cytokine release, proliferation, cell death, activation by antigens, surface proteins expression and signaling proteins [7–14]. Single free fatty acids have been shown to induce cell death when used at various concentrations in different cellular models [4, 5, 8, 15, 16]. To study the pro- or anti-inflammatory effects of fatty acids combinations on cytokine production by lymphocytes it is important to explore the effects of fatty acids at non cytotoxic doses. These data would be more relevant to a typical diet where food ingested does not have a cytotoxic effect and could demonstrate alterations in inflammatory cytokines. In spite of the well-recognized beneficial effects of omega-3 fatty acids for human health, there is a lack of data regarding the effect of canola oil, a common food source rich in α-linolenic acid (omega-3 fatty acid) versus corn oil rich in linoleic acid (omega-6 fatty acid), on lymphocytes. In this study, Jurkat T leukemia cells were treated with free fatty acids mixtures in ratios mimicking that found in commercially available canola oil (7% α-linolenic, 30% linoleic, 54% oleic) or corn oil (59% linoleic, 24% oleic) at non cytotoxic dose to determine changes in expression levels of inflammatory cytokines and receptors following oil treatment. The following reagents were used: propidium iodide, Tri-Reagent, 2-propanol, 1 bromo-3-chloro propane, RNase A, ethanol, 3-sodium citrate, butylated hydroxytoluene (BHT) from Sigma-Aldrich; α-linolenic acid (Cayman Chemical Company), linoleic acid and oleic acid (MP-Biomedicals, LLC); Triton-X100 (IBI Shelton Scientific, Inc.); Chloroform and Hexane (Honeywell, Burdick & Jackson™), Methanol (Fisher Scientific), Isooctane (EMD). Jurkat, Clone E6-1 cells (gift from Dr. Pyali Dasgupta, MU) were maintained in 10% FBS (Hyclone) in RPMI-1640 (ATCC) supplemented with 100 units/ml penicillin and 0.1 mg/ml streptomycin (Sigma-Aldrich). The cells were kept in a humidified atmosphere, at 37°C, containing 5% CO2. The cells were seeded at a cell density of 3 × 105 per ml for all experimental designs. The free fatty acids, in ratios mimicking that found in commercially available canola oil (7% α-linolenic, 30% linoleic, 54% oleic) or corn oil (59% linoleic, 24% oleic) were dissolved in ethanol. Cells were treated with an oil concentration of 75 μM, 100 μM or 150 μM for 48 or 72 hours. The final concentration of ethanol in culture media did not exceed 0.15%. Cell viability and membrane integrity were assessed by Trypan Blue exclusion and propidium iodide staining, respectively. After treatment, the cells were washed with PBS and stained with propidium iodide (20 μg/ml) for 15 min in the dark, at room temperature. The cells were analyzed on a FACSAria flow cytometer (Becton Dickinson) using DIVA software (Becton Dickinson) and the propidium iodide positive population was evaluated. The Trypan Blue exclusion assay was used to determine cell viability, and the live cells (negative for staining) and dead cells (positive for staining) were enumerated using a hemocytometer. Jurkat cells were treated as indicated, then washed twice with PBS and resuspended in Annexin V binding buffer (0.01 M HEPES, 0.14 M NaCl and 2.5 mM CaCl2). Annexin V-Pacific Blue™ conjugate (Invitorgen, Molecular Probes) and propidium iodide (20 μg/ml) were added to the cells for 15 min in the dark, at room temperature. Cells were analyzed on a FACSAria flow cytometer using DIVA software and the Annexin V positive/propidium iodide negative population was considered early apoptotic. Treated cells were subjected to DNA content analysis. Briefly, the cells were harvested and washed two times with PBS and fixed with cold 70% ethanol for at least 24 hours. The ethanol was removed and followed by two PBS washes. Cells were stained in the following solution: PBS supplemented with 0.1% Triton X-100, 0.1% Na3-citrate, 30 μg/ml RNase and 20 μg/ml propidium iodide. After incubation in the dark for 30 minutes at room temperature the cells were analyzed on a FACSAria flow cytometer. DNA fragmentation was determined by cell cycle analysis using DIVA software. The fatty acid composition of treated cells was analyzed by gas chromatography. After treatment, cells were washed four times in PBS then homogenized in distilled water containing 0.1% BHT to prevent fatty acid oxidation. Lipids were extracted with chloroform/methanol, and the fatty acids were methylated followed by separation and identification using gas chromatography. Briefly, gas chromatography was performed using a PerkinElmer Clarus 500 Gas Chromatograph (Shelton, CT) with a Elite-WAX Polyethylene Glycol Capillary Column (Length: 30 m, Inner Diameter: 0.53 mm), at 220°C for 100 min with a helium carrier gas flow rate of 2 ml/min. A fatty acid methyl ester standard (Nu-Chek-Prep, Elysian, MN) GLC #704, which contains 10 fatty acids (methyl esters of stearate, oleate, linoleate, alpha linolenate, gamma liniolenate, homogamma linolenate, arachidonate, eicosapentaenoate, docosapentaenoate, and docosahexaenoate) was used for peak identification. The fatty acid methyl esters were reported as the percent of the total methylated fatty acids (area under the curve). Human Inflammatory Cytokines and Receptors RT2Profiler™ PCR Array, RT2 First Strand Kit and SuperArray RT2 qPCR Master Mix (SuperArray Bioscience Corporation, Frederick, MD) were used to analyze the expression of a panel of genes in cells treated at 75 μM oil concentration for 72 hours. After treatment, cells were homogenized in Tri Reagent following the protocol of the manufacturer to isolate the RNA. RNA quality control was performed for all samples. The gene expression assay followed the protocol provided by SuperArray. The relative fold differences in gene expression and statistical analyses were calculated on SuperArray software. Gas chromatography was performed to investigate whether the cells were able to uptake the canola and corn oil mimetic. Jurkat cells were treated with 150 μM canola or corn oil mimetic for 72 hours. When comparing the canola oil mimetic treatment with the corn oil mimetic treatment, the canola oil mimetic treated cells had significantly more α-linolenic (LIN) acid and more of the biosynthetic omega-3 fatty acids products (EPA, DPA) (n = 4, p < 0.005) (Figure 1). The corn oil mimetic treated cells showed increased levels of linoleic acid (LA) and the biosynthetic omega-6 fatty acids products (GLA, HGLIN, AA) at a higher fraction than canola oil mimetic (n = 4, p < 0.005) (Figure 1). Lipid composition of Jurkat cells treated with 150 μM canola or corn oil mimetics. The values are presented as mean +/- SEM of four samples. * p < 0.005 for comparison between the canola versus corn oil mimetic treatment by t-test. OL--oleic acid; LIN--α-linolenic acid; LA--linoleic acid; EPA--eicosapentaenoic acid; GLA--gamma linolenic acid; DPA--docosapentaenoic acid; HGLIN--homo-gamma linolenic acid; DHA--docosahexaenoic acid; AA--arachidonic acid. Ethanol was used as a carrier for the fatty acids and addition to cell culture did not induce any change in lipid content compared to non-treated cells. As was expected, comparison of either fatty acid treatment (canola or corn oil mimetic) to ethanol and non-treated controls demonstrates a change in the lipid content. Both the canola and corn oil mimetic increased the percentage of linoleic acid (an omega-6 fatty acid) when compared to ethanol and non-treated cells. Although the canola mimetic contains more omega-3 fatty acids than corn oil mimetic, it is essential to note that it also contains a percentage (30%) of linoleic acid, although less than the corn oil mimetic (59%). Therefore, the increase in linoleic acid for both treatments is expected. In contrast, when comparing the two oil mimetics, it is apparent that the canola oil mimetic (containing just 7% α-linolenic acid) is generating a higher fraction of omega-3 fatty acids than the corn oil mimetic. 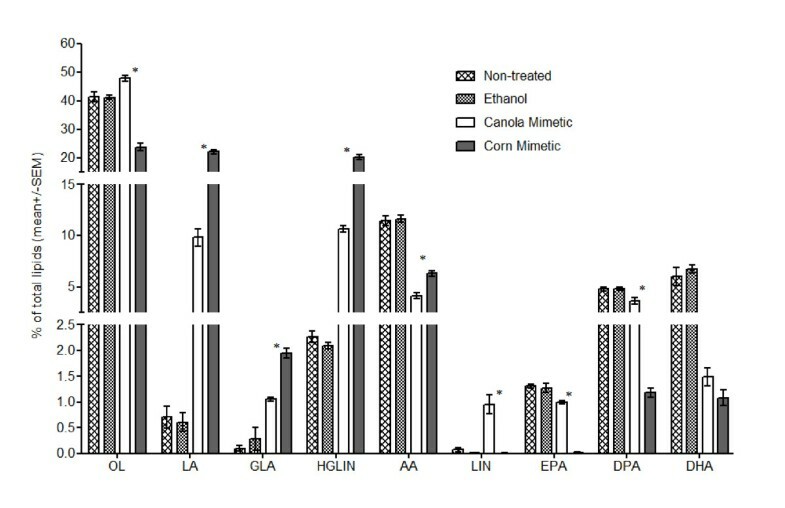 Despite the comparable percentages of EPA or DPA between controls (non treated and ethanol treated cells) and the canola oil mimetic, noteworthy is the decrease in omega-3 fatty acids in the presence of the corn oil mimetic. Trypan Blue exclusion (Figure 2A) showed that treatment with 100 and 150 μM canola or corn oil mimetic treatment for 72 hours significantly decreased the percentage of viable cells when compared to the controls (non-treated and ethanol treated cells) (n = 6, p < 0.05). Among the treatments, 150 μM corn oil mimetic showed the highest decrease of cell viability by Trypan blue (n = 6, p < 0.05) (Figure 2A). Propidium-iodide staining (Figure 2B) showed a significant increase in the percentage of cells that lost of membrane integrity in the treated cells (150 μM canola or corn oil mimetic for 48 hours) when compared to the controls (non-treated and ethanol treated cell) (n = 3 for non-treated, n = 4 for all other samples, p < 0.05). Membrane integrity of Jurkat cells treated with canola and corn oil mimetics. A. Percentage of viable cells, treated for 72 hours with 75, 100 and 150 μM oil mimetics, showed by Trypan Blue exclusion. The values are presented as mean +/- SEM of six samples. * p < 0.05 by Newman-Keuls multiple comparison test, when compared to controls (non-treated and ethanol treated cells); ℓ p < 0.05 by Newman-Keuls multiple comparison test, when compared to the controls and all other treatments. B. percentage of cells losing the membrane integrity, treated for 48 hours with 150 μM oil mimetics, showed by propidium-iodide staining * p < 0.05 by Newman-Keuls multiple comparison test n = 3 for non-treated, n = 4 for all other samples. The loss of membrane asymmetry and the exposure of phosphatidylserine on the outer surface of the cell membrane as an early apoptotic marker was detected with Pacific Blue labeled AnnexinV. Jurkat cells treated with canola or corn oil mimetic at 100 μM and 150 μM for 48 hours showed a significant increase in Annexin V+/propidium iodide- population compared to the controls (non-treated and ethanol treated cells) (n = 3 for 150 μM non-treated, n = 4 for all other samples, p < 0.05) (Figure 3A). Apoptosis A. Phosphatidylserine exposure in cells treated at 100 μM and 150 μM for 48 hours. The values are presented as mean +/- SEM of three samples for 150 μM non-treated and four samples for all other treatments and controls. * p < 0.05 by Newman-Keuls multiple comparison test. B. Cell cycle analysis of cells treated with 75, 100 or 150 μM oils for 72 hours. The values are presented as mean +/- SEM of six samples. * p < 0.05 by Newman-Keuls multiple comparison test, when compared to controls (non-treated and ethanol treated cells); ℓ p < 0.05 by Newman-Keuls multiple comparison test, when compared to the controls and 75 and 100 μM oil treatments; °p< 0.05 by Newman-Keuls multiple comparison test, when compared to 150 μM canola oil mimetic treatments. The degradation of the nuclear DNA as a late apoptotic marker was assessed by the formation of the 'sub-G1' population . Cell cycle analysis of Jurkat cells treated with 75, 100 or 150 μM canola or corn oil mimetic for 72 hours was evaluated (Figure 3B). When comparing the treatments to the controls (non-treated and ethanol treated cells), there was a significant increase in the 'sub-G1' population for the following treatments: 100 and 150 μM canola oil mimetic and 75, 100 and 150 μM corn oil mimetic (n = 6, p < 0.05) (Figure 3B). 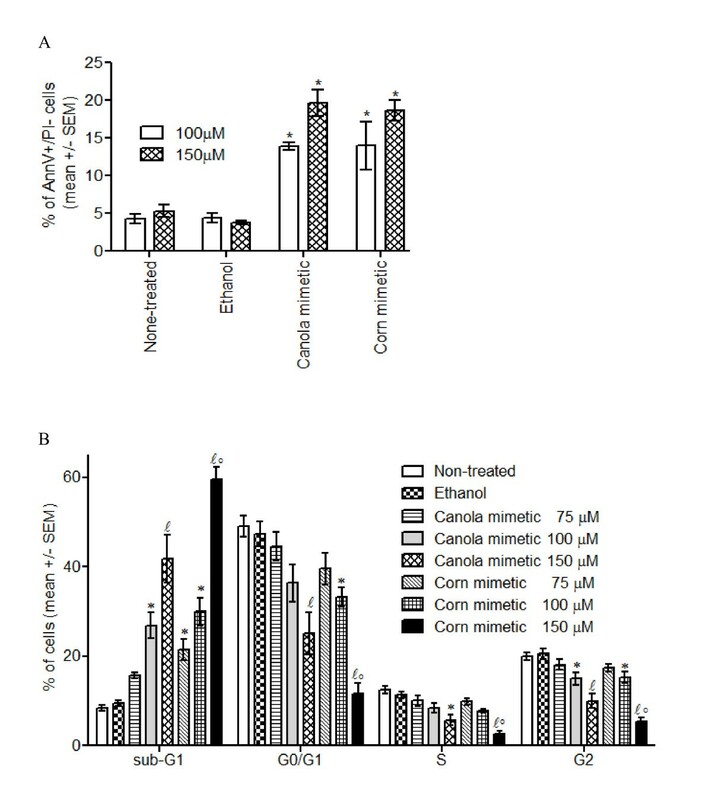 When comparing the 150 μM corn oil mimetic treatment with the 150 μM canola oil mimetic treatment, the 'sub-G1' population was significantly higher in the corn oil mimetic treated cells. The exposure of early apoptotic marker phosphatidylserine at 48 hours followed by loss of membrane integrity and DNA fragmentation at 72 hours indicates that treatment with ≥ 100 μM canola or corn oil mimetic induced apoptosis in Jurkat cells. There was a significant decrease in the percentage of Jurkat cells in the G0/G1 phase for cells treated with 100 μM corn oil mimetic compared to the controls (non-treated and ethanol treated cells) (n = 6, p < 0.05) (Figure 3B). There was a significant decrease in the percentage of Jurkat cells in the G0/G1 phase for cells treated with 150 μM canola or corn oil mimetic when compared to the controls (non-treated and ethanol treated cells) or to the other treatments (n = 6, p < 0.05) (Figure 3B). Moreover, when comparing 150 μM corn oil mimetic to 150 μM canola oil mimetic treatment there was a statistically significant difference in the G0/G1 phase between the treatments. There was a significant decrease in the percentage of cells in the S phase of both 150 μM canola and corn oil mimetic treated cells when compared to the controls (non-treated and ethanol treated cells) (n = 6, p < 0.05) (Figure 3B). The percentage of cells in the S phase was significantly decreased by 150 μM corn oil mimetic when compared to all other treatments. The percentage of cells in G2 exhibited a significant decrease for 100 and 150 μM oil treatment when compared to the controls. Cells treated with 150 μM oil mimetic exhibited a significant decreased fraction in the G2 phase when compared to 75 and 100 μM canola or corn oil mimetic. Also, there was a significant difference in the G2 phase fraction between corn and canola oil mimetic at 150 μM concentration. The highest concentration of oil not inducing significant changes in the cell cycle of Jurkat cells was 75 μM. This dose was utilized to investigate the effect of canola and corn oil mimetic on expression of inflammatory cytokines and receptors. Jurkat cells treated with 75 μM canola oil mimetic for 72 hours showed a 3.46 fold up-regulation (n = 3, p = 0.0193) for CCL5 (RANTES), compared to corn oil mimetic treated cells (Table 1). Moreover, gene expression analysis following canola oil mimetic treatment showed a trend towards down-regulating expression of CCL11, CARD18, IL8 and IL8RB when compared to the controls (non-treated and ethanol treated cells). Whereas, corn oil mimetic treatment showed a trend towards up-regulating the expression for the same genes (CCL11, CARD18, IL8, IL8RB) as compared to the controls. To better assess the differences in the gene profiling as a response to the oil mimetic treatments, the oil treatment groups were compared. Table 1 shows a significant down-regulation of gene expression in canola oil mimetic treated cells when compared to corn oil mimetic treated cells. A low oil concentration (75 μM) did not have a significant effect on cell cycle but was able to induce differences in gene expression. It is widely accepted that free fatty acids can induce cell death in in vitro models [4, 8, 15, 18]. Free fatty acid mixtures in ratios mimicking that found in commercially available canola oil (7% α-linolenic, 30% linoleic, 54% oleic) or corn oil (59% linoleic, 24% oleic) had a cytotoxic effect on Jurkat T leukemia cells at high concentration (≥ 100 μM). Even though both treatments were cytotoxic one hundred fifty micromolar canola or corn oil mimetic treated cells resulted in different lipid compositions and significant differences in cell cycle and cell death response indicating that the treatments were doing more than just killing cells. Corn oil mimetic treated Jurkat cells had a significantly higher uptake of linoleic acid followed by synthesis of more longer chain omega-6 fatty acids (gamma linolenic, homo-gamma linolenic, arachidonic acid) than canola oil mimetic treated cells. Canola oil mimetic treated cells had a significantly higher uptake of α-linolenic acid and were able to synthesize more of the longer chain omega-3 fatty acids (eicosapentaenoic acid, docosapentaenoic acid, docosahexaenoic acid) than corn oil mimetic treated cells. Both oil mimetic treatments at a concentration ≥ 100 μM increased the DNA fragmentation ('sub-G1 population'). The DNA fragmentation was associated with a decreased in the percentage of cells in the other phases of cell cycle. Previous studies using individual fatty acids showed that linoleic acid was cytotoxic at 100 μM and α-linolenic acid had an anti-proliferative effect at 60 μM . Cury-Boaventura et al. showed that 50 and 100 μM linoleic acid induced phosphatidylserine exposure, an early marker for apoptosis, on human lymphocytes. The authors suggested mitochondrial depolarization and ROS production as a mechanism for cell death induced by 200 μM linoleic acid. ROS represent key molecules involved in multiple cellular functions like cell adhesion, apoptosis, regulation of immune responses . On Jurkat cells 130 μM linoleic acid or 60 μM α-linolenic acid had a prooxidant-induced antiproliferatve effect that was negatively correlated with caspase 3 activation . In addition, the pro-apoptotic activity of α-linolenic acid has been associated with up regulation of Bax expression and cytochrome c translocation . In support of these previous studies, the present study demonstrates that canola and corn oil mimetic induced apoptosis and significant changes in cell cycle at a concentration of 100 μM. Further investigations are required to establish the mechanism involved in linoleic and α-linolenic fatty acids modulation of cell cycle progression. Many studies have used single long chain omega 3 or 6 fatty acids to modulate cell cycle progression in different cancer cell lines [20–23]. For example, arachidonic acid increased expression of cyclin D1 mRNA and the percentage of cells in S phase . Docosahexaenoic acid reduced cyclin D1, E, and A-associated kinase activity and prevented the entry of cells in S phase . Eicosapentaenoic acid inhibited synthesis and expression of cyclin D1 and E and blocked cell cycle in G1 . Trans-10, cis-12 conjugated linoleic acid increased the levels of p21cip1/waf1 and blocked the cells in G0/G1 . However, there is a lack of data regarding the effect of the two essential fatty acids, linoleic and α-linolenic acid present in the most commonly cook oils, corn and canola oil, respectively. The association between inflammation and cancer is thought to be a critical component for cancer development . The polyunsaturated fatty acids (n-3, n-6) are responsible for the production of families of anti- and pro-inflammmatory bioactive lipid mediators . In vivo studies showed that omega 3 fatty acids decreased chemoattractant protein-1 (MCP-1), interleukin (IL)-6, interferon (IFN)-gamma mRNA expression , and TNF-α level . In vitro linoleic acid and α-linolenic acid inhibited IL-2 production . In this work, a low oil concentration (75 μM) did not have a significant effect on cell cycle but was able to induce differences in gene expression. One such gene, CCL5 (Regulated upon Activation, Normal T-cell Expressed, and Secreted, abbreviated RANTES) has a dual role regarding tumorigenesis. CCL5 can mediate tumor cell survival, cell growth and metastasis in a number of malignances [28–31]. CCL5 is also proposed as a natural adjuvant to boost anti-tumor immunity . 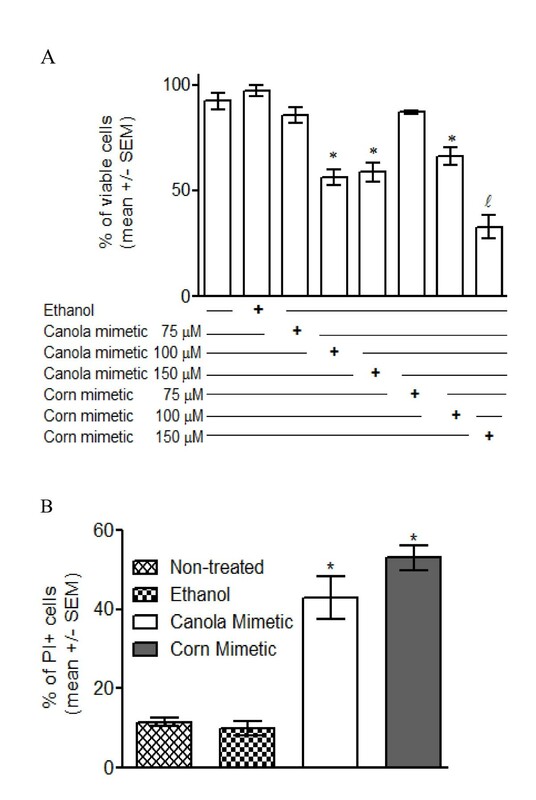 In our experimental design, canola oil mimetic increased CCL5 expression compared to corn oil mimetic treatment. Moreover, the proinflammatory molecules, IL8 (interleukin8), IL8RB (interleukin8 receptor, beta known as CXCR2), CARD18 (caspase recruitment domain family, member 18; ICEBERG) and CCL11 (chemokine (C-C motif) ligand 11) were slightly down-regulated in canola oil mimetic Jurkat treated cells compared to slightly up-regulated in corn oil mimetic treatment. IL-8, a chemotactic factor for leukocytes, has been shown to contribute to human cancer progression through its potential functions as a mitogenic and angiogenic factor . CARD18 (ICEBERG), induced by pro-inflammatory stimuli, inhibits generation of IL-1β by interacting with caspase-1 and preventing its association with RIP2 . CCL11 (eotaxin-1) displays chemotactic activity for eosinophils  and is a key player in the angiogenic cascade . Taken together, suppression of these chemokines would be expected to slow cancer progression. This study was designed to explore the effects of oil mimetics in ratios found in two common cooking oils (canola and corn) on Jurkat T leukemia cells. At high concentrations (100 and 150 μM) both types of oils induced apoptosis. At a non-toxic dose (75 μM) the different oil mimetics displayed differences in their action on pro-inflammatory molecules with canola oil being anti-inflammatory whereas corn oil was pro- inflammatory. Findings from this study emphasize the need to investigate the effect of dietary fat within complex mixtures at non-cytotoxic doses when evaluating the inflammatory response. Oil mimetic could be enough to induce differences in fatty acid and immune modulator profiles. This is critical in regards to the importance of examining conventional diet sources in human health and disease. Oil mixtures are more physiologically relevant than single fatty acids since humans must consume both omega-3 and omega-6 fatty acids. In this respect canola oil may have a more favorable fatty acid profile for decreasing the chance of inflammation that is promotional for development of chronic diseases. Financial support by NCI grant CA114018-01 and Cancer Research and Prevention Foundation is gratefully acknowledged. We thank Dr. Melissa J. Seelbach and Margaret Putt for reading the manuscript and helpful discussion. All authors have read and approve the final manuscript. GI designed the study, analyzed, interpreted the data, and drafted the manuscript. KF carried out the apoptosis assays and gas chromatography. JAA carried out the gene array. WEH gave the final approval of the version to be published.